To be honest, this is a t-shirt expansion, but who wants to write that in a title? 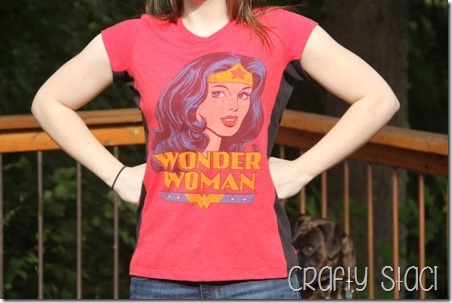 I bought this shirt a few years ago and wore it once. Typically, the problem I have with t-shirts is that they shrink in length, even washing in cold and drying on low. I’m long-waisted, so that really doesn’t work for me. However, this particular shirt kept its length, but shrunk around, and it wasn’t particularly stretchy to begin with. I could get it on, but breathing was an issue. I’m not even going to talk about those arm holes. In order to add more space, I decided to add a knit panel to each side. I happened to have a black t-shirt that someone had clearly worn in the kitchen and splattered something oily across the entire front of it, so I cut up the undamaged back. The good news is, now I have an apron. 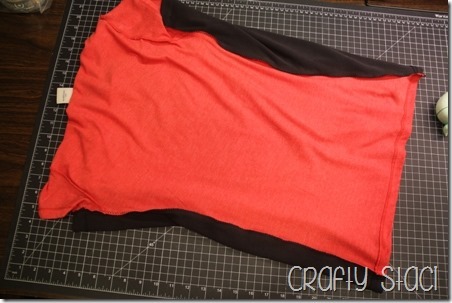 If you don’t have a throwaway shirt to cut up, a piece of knit fabric will work as well. 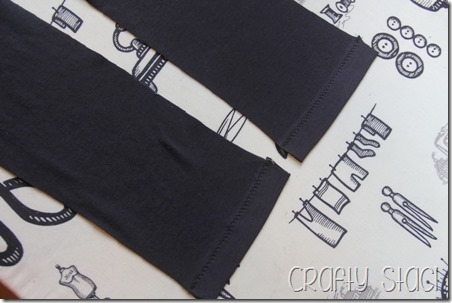 Lay the shirt out flat with the side seam up. 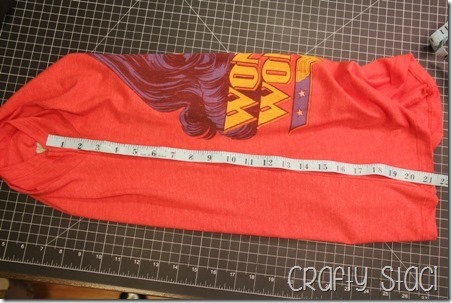 Measure the underarm seam from the edge of the sleeve to the bottom of the shirt. Make a note of the measurement. 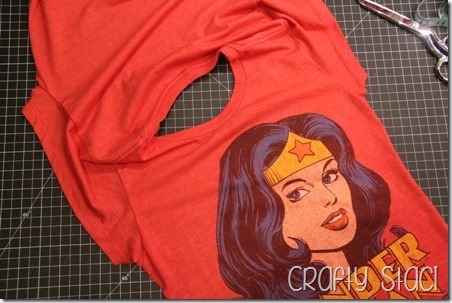 Remove the seam by cutting close to it on both sides. You’re welcome to use a seam ripper and unstitch it instead, but I figured since I was adding fabric anyway it was not worth the extra time. You should be able to open out the shirt like this. 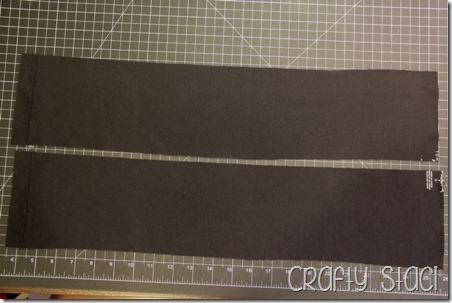 Cut two pieces of knit the width you want to add (remember you’re adding it to both sides) plus one inch. Cut the length the measurement of the side seam plus 2 inches. 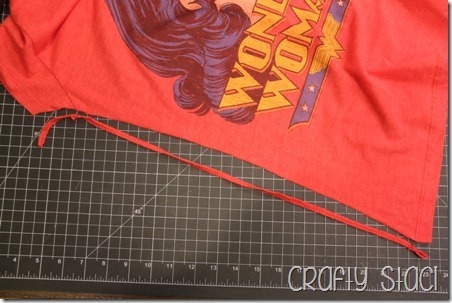 I reused the existing hem on the t-shirt I cut up, so I only added one inch. 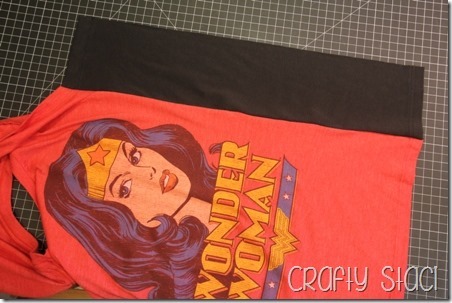 Hem the top and bottom edges by folding under 1 inch, pressing and sewing. I used a narrow zig-zag stitch. 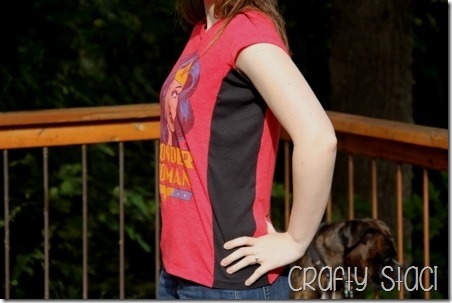 Lay the panel face down on the side of the shirt. Match the ends to the sleeve and bottom hem and line up the edges. Pin generously. Repeat with the other side. Stitch with a 1/2” seam. Again, I used a narrow zig-zag, then went over the edges again with a wider zig-zag stitch to finish. Fold the panels out. Bring the back of the shirt down over the top, so the right sides of the shirt and panels are facing each other. Pin in place and stitch, just like you did with the front of the shirt. Turn it right side out, and…it looks really weird, right? I was a little worried at this point, but it’s really cute once it’s on a body. The inserted panel looks like it belongs there. 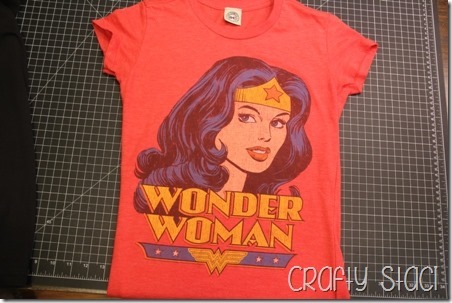 T-shirt saved!